The Handkerchief Vase (or Hankerchief Vase) personified the 1950s' design aesthetic of fluid, asymmetrical shapes. It is this tendency towards flowing organic shapes that distinguishes 50s' design, both from the Art Deco period that it followed and the 1960s. The original Handkerchief Vase by Venini in Murano, Italy embodied this principle, later copies by Chance Glass in the UK, do not. However, they represent the kitsch aspect of fifties' design that makes it fun. The original 'Vaso Fazoletto' or 'Handkerchief Vase' was designed by Paolo Venini and Fulvio Bianconi in 1949. Throughout the 50s, they produced an enormous variety of designs. There were striped patterns; plain patterns combining two different colours, such as red and white; there were spiral patterns and fine woven patterns. Some were gigantic, others were very small. The success of the Venini Handkerchief Vase lead to imitations by other firms. There were several firms in Italy that produced similar designs, but in the UK, Chance Brothers was the most prolific manufacturer of this style of glassware. The Chance Brothers Handkerchief Vase was a UK version of the Italian design. Their designs took the handkerchief metaphor to its logical conclusion. Many resemble a polka dot, striped or gingham hanky. There are also some transparent versions and psychedelic or Pop Art designs from the 1960s. Chance Brothers Handkerchief Vases were made from 1957 to 1981, when the factory closed. Pinstripe is one of the oldest designs dating from the late 50s, whereas Gingham was only made from 1977 and was manufactured after 1981 by Fiesta Glass. Like for most collectables, eBay is a good source. You should expect to pay upwards of £100 for a Venini Handkerchief Vase in perfect condition. Italian copies from other Murano factories sell for £50 to £100. Chance Glass vases sell for £10 to £20. They are quite common, so be very fussy about condition: no chips or damage. It is not difficult to find mint condition vases. 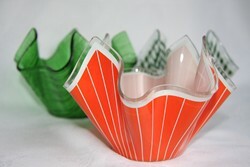 Visit www.chanceglass.net for more information about Chance Glass Handkerchief Vases.